*There are no holes or rips on the straps but they are scuffed. *The soles have little dirt from use. Mixing normal sandals and boats tends to result in broken, bleeding toes and furious boat owners. 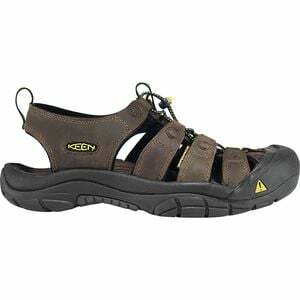 The Keen Newport Sandals were developed in the sailing mecca of Rhode Island to solve these problems while retaining the comfort of sandals. A toe guard protects your nubs from deck rigging or rocks on shore. The Newport's soles are made from a grippy, non-marking rubber that prevents you from slipping and falling overboard, or being thrown by black-mark-addled boat owners. The Newport's waterproof leather upper and anatomical last make it comfortable enough for extended wear on long blue water voyages, or just walking around town.